Cardcaptor Sakura: Cardcaptor Sakura Calendar 2002 A Nov. & Dec.
Minitokyo »	Cardcaptor Sakura Scans » Cardcaptor Sakura: Cardcaptor Sakura Calendar 2002 A Nov. & Dec.
Wow.... Sakura and her friends looks so kawaii... Sakura is sleep with Shaoran's bear? What romantic.... Good Scan! wai~!!!!! i'v never seen this picture before! its so cute! and chiharu, naoko and rika are so funny! ^^ cool scan! Oh how cute!! I love her hair :) The background is great too. This is one I haven't seen before, I'm glad I finally can view it. Aww!!! Sakura-chan is sleeping with Syaoran-kun's teddy bear! That's so cute!!! ka~wa~ii!!! haha, that's the bear she got from syaoran, how sweet <3 and chiharu~chan looks like she's trying so hard not to crack up :P thanks chibi!!! 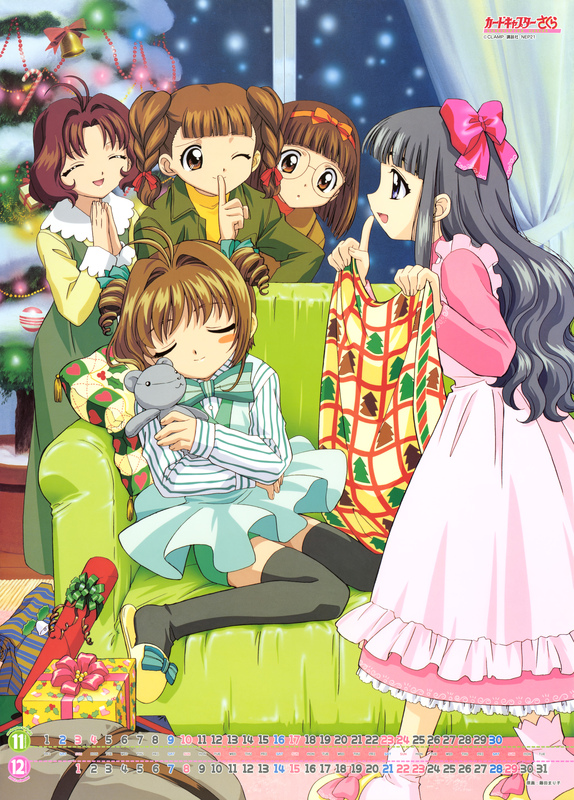 Sakura holding Shaoran's bear and look pretty.Her friends also very beautiful.Too sweet this wallpaper. very nice scan ^^ thanks for sharing! never seen this christmas scan before...but I LOVE IT! :P sakura holing syao teddy bear to sleep? CUTE!